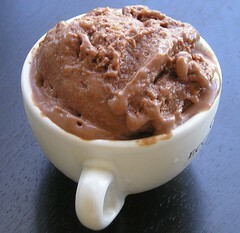 Chocolate-almond gelato - Do You Know The Muffin Man? Recipe from Bon Appétit, May 2002. Notes: True to Sicilian tradition, made without cream or eggs (just whole milk) and thickened with cornstarch. Not very chocolatey or almondy though.